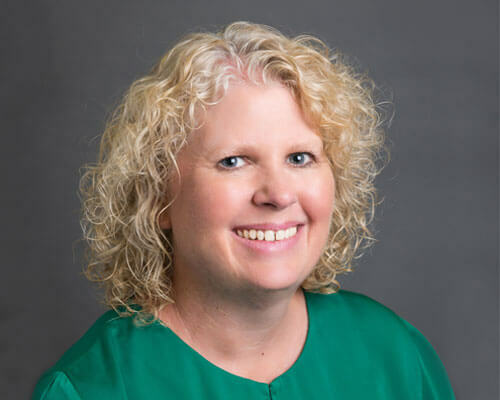 Home » Academics » Schools » Greehey School of Business » Faculty » Stephanie G. Ward, Ph.D.
Stephanie G. Ward, Ph.D., joined St. Mary’s University in 2004 after completing her Ph.D. at the University of Houston and she has never looked back. Being a Rattler is in her blood and she believes it is a privilege to be here. During her time at St. Mary’s, Ward served eight years as the founder and director of the Greehey Scholars Program, and has been the Chair of the Management and Marketing Department for the past year. Her love is being in the classroom with students engaging in thoughtful exploration of what it means to pursue a meaningful business career while challenging students to learn more than they thought they could. Being able to help a student exceed his/her potential is what drives her. Before coming to St. Mary’s, Ward worked in the banking and insurance industries in the accounting and auditing fields before realizing her passion was education. She has also taught at the University of Houston, Texas Women’s University – Houston Campus, and Alvin Community College Prison Program. When she isn’t at St. Mary’s Stephanie can be found out and about on her bicycle, working with her San Antonio non-profit chapter of Ride for Reading, hanging at her husband’s brewery, or in St. Paul listening to their son, Zach, play his guitar. Ward, S.G. (2015). Integrating Student-Centered Learning in a Compensation Management Course. Journal of the Academy of Business Education, 16: 129-143. Ward, S.G., & White, M. (2015). The Greehey Scholars Program as an Innovative Solution to the Student Debt and Employment Crisis of Recent Graduates. Academy of Educational Leadership Journal, 19(2), 159-172. White, M., Ward, S.G., & Padmanabhan, P. (2014). The Greehey Scholars Program: Developing Ethical Business Leaders While Addressing Barriers to Learning. Review of Social Studies, Law, and Psychology, 8(2): 138-149. Royalty, K., Madison, T., & Ward, S.G. (2013). Student Perceptions of the Effect of VITA Participation on AICPA Core Competency Development. Mustang Journal of Accounting and Finance, 4: 37-48. Priesmeyer, H.R., Ward, S.G., & Murray, M.A. (2008). Fostering a Wholistic Education: A Practical Approach for Advisors. Journal of College Teaching & Learning, 5(6): 51-58. Parzinger, M., Ward, S.G., & Langford, M. (2014). Web Recruitment: Impact of Aesthetics and Playfulness on User’s Initial Affective Reactions as it Relates to Applicant Attraction. International Journal of the Academic Business World, 8(1): 57-66. Madison, T., Ward, S., Royalty, K. (2012). Corporate Social Responsibility, Organizational Commitment, and Employer-Sponsored Volunteerism. International Journal of Business and Social Science, 3(1): 1-14. Elkins, T., Phillips, J., & Ward, S.G. (2008). Organizational Sexual Harassment Investigations: Observers’ Perceptions of Fairness. Journal of Managerial Issues, 20(1): 88-108. Envick, B., Langford, M., Ward, S. (2008). Using Family Firm Boundary Management Theory to Explain the Impact of Privacy Issues on Family Firm Research. Academy of Entrepreneurship Journal, 14(1): 37-50. Madison, T., Ward, S.G., & Royalty, K. (2008). Volunteer income Tax Assistance (VITA) Episodic volunteers: Training and Retraining. The International Journal of Volunteer Administration, 25(3). Cory, S., Ward, S.G., & Schultz, S. (2007). Managing Human Resources in a Small Firm: Motivation through Performance Evaluation. The CPA Journal, 77(10): 62-65. Ward, S.G., Envick, B.R., & Langford, M.L. (2007). On the Theory of Psychological Contracts in Family Business. The Entrepreneurial Executive, 12: 37-50. Ward, S.G., & Werner, S. (2004). Ten Compensation Studies You Should Know About. WorldatWork Journal, 13(1): 62-71. Werner, S., & Ward, S.G. (2004). Recent Compensation Research: An Eclectic Review. Human Resource Management Review, 14(2): 201-229. Werner, S., & Ward, S.G. (2001). Cutting Through the Fog of Academic Writing: Ten Studies Worth Deciphering. WorldatWork Journal, 10(1): 47-55.